Mountains of Pennsylvania, Pinemere has created an exceptionally beautiful environment to foster the positive growth and development of each of its campers. Pinemere has always been dedicated to offering children from small communities with minority Jewish populations a chance to enjoy a summer camp experience in a majority Jewish setting. While the camp functions in its traditional role as a resident summer camp from the middle of June until the middle of August each season, its 200-acre facility is available for rental during the balance of the year. During both the warm and cold off-seasons, the camp can provide an ideal setting for adults and youth enjoying retreats, reunions, meetings and all manners of gatherings. A site accredited by the American Camping Association awaits you. Built into the hills, rocks and trees of the Pocono Mountain town of Bartonsville, Pinemere’s many acres offer an environment that remains very much the same as when the camp was first built. Sheltered from the outside world by its expansive woods, the camp’s facilities are centrally located amidst the trails and beauty of the area. With its own private 9-acre lake, Pinemere resembles the sites of old – with the modern conveniences of today. LINE UNIT – Cabins used by our campers that have sleeping areas with single cots/bunk beds and shelves, bathrooms with toilets, sinks and showers and common areas, foyers and porches. Windows are screened with heavy canvas flaps to raise and lower. All cabins have full electricity. This unit has 7 cabins that are divided into 3 buildings. May 1st through June 1st or August 20th through October 15th. Capacity is 58 persons. ROW UNIT – Same as LINE UNIT. This unit has 10 cabins that are divided into 6 buildings. May 1st through June 1st or August 20th through October 15th. Capacity is 78 persons. HILLTOP UNIT – Same as LINE UNIT. This unit has 7 cabins that are divided into 4 buildings.May 1st through June 1st or August 20th through October 15th. Capacity is 72 persons. HEALTH CENTER/WINTER LODGE 1 – This weatherized building is used in the summer as the camp’s Infirmary. For off-season use, there are two large rooms which each have cot-sized bunk beds and one private bathroom with toilet, sink and shower/bath. The rooms can each house up to 22 persons. In addition, there are four private rooms, each with their own bathroom. These rooms are for one or two persons each. This building also has a main room, small kitchen area and additional bathroom. August 20th through June 1st.. Capacity is 30 persons. STAFF RESIDENCE/WINTER LODGE 2 – This heated building is used in the summer as a Staff residence. For off-season use, there is one large room with cot-sized bunk beds and a bathroom with multiple toilets, sinks and showers. This room can house up to 22 persons. In addition, there is a private room for up to two persons. August 25th through June 10th. VINCENT FLOWERS DINING HALL – This building is used during the summer for our entire camp. With a very large dining room and commercial kitchen, it can accommodate any size group at camp. Meals are served family style, with tables of six to twelve. May 1st through June 1st or August 20th through October 15th . JOHN BERNHEIMER CONFERENCE CENTER – This heated facility provides a very long room for large meetings and gatherings. With full bathrooms, it can also be used for residential living if needed. It is equipped with audio/video hookups, television and projection screen. This building also houses the WINTER KITCHEN and dining area. August 20th through June 1st . Capacity is 45 persons. WINTER KITCHEN/DINING AREA – Located in the BERNHEIMER BUILDING, this building has dining seating for up to 45 people. August 25th through June 10th. SOL LIPTON STAFF LOUNGE – This large room has seating and accommodations for meetings and gatherings, with a large projection television and video. May 1st through June 1st or August 20th through October 15th . REC HALL & DELL – A very large building that can be used for meetings, gatherings, productions and more. It is equipped with a full stage, lighting and sound, as well as a large porch and fireplace. May 1st through June 1st or August 20th through October 15th . NATURE BUILDING & ARTS BUILDING – Both buildings can be used for meetings or for their respective activity areas when properly staffed. The Nature building has a fireplace, and both have large porch areas. May 1st through June 1st or August 20th through October 15th . CHAPEL – Outdoor seating area with benches that faces an enclosed podium area. May 1st through June 1st or August 20th through October 15th . ROBERT H. MINER FIELD HOUSE – Very large gymnasium with full athletic facilities, including basketball, volleyball, indoor soccer and hockey. It has six basketball baskets, scoreboard and equipment room, as well as two restrooms. This building may be used in cold weather with the assistance of two industrial space heaters. May 1st through June 1st or August 20th through October 15th . BOATING, BEACH & SWIMMING POOL – These Waterfront areas are available only in warm weather, and must be staffed with certified Lifeguards. There is a 9-acre lake for canoeing, rowboats, fun-yaks and more, and a ½-Olympic-sized pool with lanes and diving area. May 15th through June 1st or August 20th through October 15th . ATHLETIC FIELDS, BASKETBALL, HOCKEY, TENNIS, GA-GA & VOLLEYBALL COURTS AND MINIATURE GOLF – These outdoor areas are available for use. These include softball, lacrosse and soccer fields, 6 lighted outdoor basketball baskets and hockey court, 3 lighted tennis courts, both grass and sand volleyball courts and 6 holes of mini-golf. August 20th through June 1st . ADVENTURE COURSE – This area included 25-foot Climbing Tower, High Challenge and Team Challenge Courses and Zip Line. Under the direct supervision of camp’s staff, these elements can be used, if pre-arranged, at additional costs to the group. May 1st through June 1st or August 20th through October 15th . 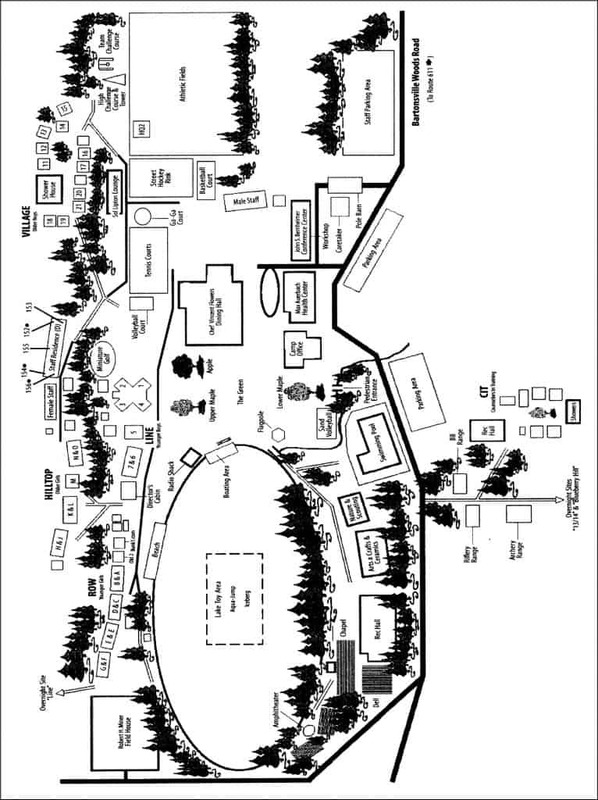 There is a map included in this booklet that gives an overview of the camp’s facility. There are additional options available than those listed above, so please feel free to inquire regarding your specific needs. As part of a group’s rental of Pinemere, the camp provides a wonderful food service that can be catered to each group’s individual needs. 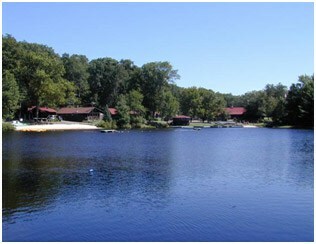 As has been the tradition for many years, Pinemere is a kosher camp. Following ancient Jewish dietary laws, the food service maintains these guidelines throughout the year regardless of the group’s own affiliation. For those unfamiliar with kosher laws, the basic restriction is that dairy products and meat products will not be served at the same meal. Otherwise, the menu will appeal to any group’s interests. Our standard service includes breakfast, lunch, dinner and nighttime snack. The menu is diverse and features fresh, homemade items. Special accommodations may be made in case of vegetarians, diabetics and other dietary restrictions. Pinemere’s fine staff prepares all foods, while each group is asked to assist in the setting and serving of the meals. We ask that no food items be brought along to camp unless the camp’s Director has given special permission. In addition to the basic menu, Pinemere also has a full Canteen that offers candy and sundry items for sale. Meals are served in our Dining Hall in late spring and early fall, and in the Winter Kitchen for the remainder of the year. Meal selections, decisions on menu items and time schedules are to be determined by the group leader and the camp’s Director. Such things as bag-lunches, brunch, campfire snacks and so on must be decided upon before arrival at camp. Pinemere Camp’s facilities offer a great opportunity to enjoy a variety of athletics, all within the same area. With basketball, soccer, hockey, tennis, lacrosse, volleyball and more at your fingertips, a group can enjoy a wide variety of fun. There are areas both indoors and outdoors to enjoy these pastimes, and Pinemere can provide all necessary equipment. We ask that all items be requested prior to arrival, and that all materials be returned as instructed. 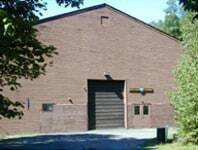 One of Pinemere’s finest additions is the Robert H. Miner Field House. This large indoors athletic and program facility can accommodate almost any activity. The Field House has 6 basketball baskets, two that are adjustable, volleyball nets, hockey goals, indoor soccer goals and more. If the Field House is needed for a group, an additional fee may apply. Our site has a private 9-acre lake and ½-sized-Olympic Swimming Pool available when weather permits. The lake offers canoeing, rowboats, fun-yaks and other fun options, while the pool is great for both lap swimming and play. In fact, the pool features both a low and high dive in its diving area. These areas are open only when made available by the camp’s Director and staffed by certified staff. In most cases, Pinemere will provide the Lifeguard staff, while a group’s fee may reflect their additional cost. Staff is necessary at both the lake and pool, without exception. When waterfront areas are provided during a group’s stay, it is imperative that all group participants follow the explicit guidelines set forth by the camp’s staff. This includes the use of PFDs (Personal Flotation Device) in all watercraft and other such rules. If any problems should occur, the staff reserves the right to dismiss any persons from the area in the interest of safety. All groups are responsible for their own staffing needs. This means that each group must either provide the necessary staff for their rental, or they must compensate Pinemere for doing so for them. Pinemere will only supply staff necessary for food service and programming, not for overall supervision, unless negotiated specifically. Each group must have at least one adult supervisor/staff person for every ten participants if these participants are under the age of 18 (a different ratio may apply for younger children – please consult Pinemere’s staff.) Staff also must be placed in the appropriate areas to reside with the group. Pinemere staff can be provided for use in Waterfront areas and other programs, such as athletics or Adventure. These options may be more limited during the winter months, but groups should inquire as to availability. Otherwise, Pinemere’s staff will be supplied at no charge for all food service and maintenance needs. Pinemere asks that all schedules for groups be provided previous to arrival. If any items or special provisions are needed, please indicate so as soon as possible. Pinemere staff will supervise the overall program in respect to safety and needs, but will not infringe upon the activities in any way. The camp’s intention is to help make the stay at Pinemere as wonderful as it can be, without interruption. ll rates are based on a specific group’s needs in respect to size, length of stay, food service, program and staff. Rates will be reasonable, but must be based on no less than 20 participants, including staff. For typical weekend retreats/Shabbaton, Pinemere will usually charge between $60.00 and $100.00 per person. This includes residence, basic facility use and five meals. All staff will be charged at the same rate as participants, unless specifically excluded. If individuals will not be staying for the duration of a group’s reservation, unless approved by the camp’s Director, they will still be charged the full rate for that group. In order to reserve the facility, the attached Reservation Form must be completed in full and sent to our office with a non-refundable deposit of $200.00. If the dates requested are not available at the time of receipt, groups will be contacted to make other arrangements or to receive a refund. No less than two weeks prior to the start of a reservation contract, Pinemere must receive payment equal to one-half of the balance due, excluding the initial deposit. If this payment is not received, reservations will not be held. This deposit is not refundable. The final balance for all groups is due upon arrival at camp.